Composting Equipment: What do you really need? So you’re getting ready to compost! Great! The first thing to address is supplies – retailers and friends alike will often tell you that you need this, that, or the other thing – so what is it that you really need when it comes to composting equipment? Well, there are certain things that will be essential to your composting success, but you may be surprised to find out some of the things you do and don’t necessarily need. Photo found on Flickr.com courtesy of AurorMaximus. 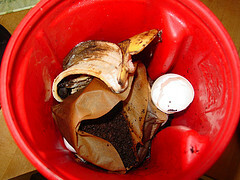 First off, you don’t necessarily need to have a compost bin to make compost. You can have a compost pile right there in the lawn. As long as you have differing strips of Nitrogen and Carbon rich materials, your compost pile will take care of itself naturally – as the decomposition process happens with ease in nature. However (as mentioned in a previous blog post), your city may have ordinances preventing you from having a compost pile, or you may simply just not want a pile of compost in your lawn. If this is the case, then a compost bin can alleviate all of your problems. It will look aesthetically pleasing and will probably also keep your homeowner’s association of your back as well (thank God). You can also get them in a variety of options, including: tumbling, rolling, multi-bin systems, square, and plastic. So, now you’ve got either a compost pile or compost bin out of the way. What additional things do you need? Well, a compost turning tool is certainly going to come in handy. A compost turner can easily keep your compost properly aerated and will aid in rapid decomposition of your organic material. In addition, you can purchase a compost fork, which will help you turn the compost to keep it aerated as well. 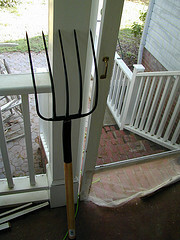 A compost fork can at times be like a pitchfork, but there are ones available that are sort of a cross between a pitchfork and a shovel to aid in picking up and turning your compost. Photo found on Flickr.com courtesy of SPACEGRRL. 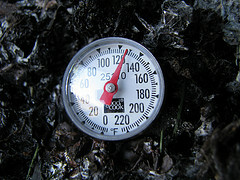 If you want to make sure all is in line with the temperature of your compost bin (this can be directly relative to the rate at which your compost pile breaks down), then you should look into a compost thermometer. These can tell you if your pile is too hot or cold, and how close to the ideal temperature it will be (ideally, you would like your compost pile to be between 104 and 150 degrees Fahrenheit. Many books will give you different temperature ranges, but it will always be acceptable to stay in this range, by doing so, your compost will be fine). If you really want to “geek out,” you can go the extra mile and look into getting a compost moisture meter. A moisture meter will let you know just how dry or wet your pile is, and gauge whether or not you need to add water to it, or dry it out in order to facilitate a quicker compost time. Nice. Photo found on Flickr.com courtesy of Hathaway_m. 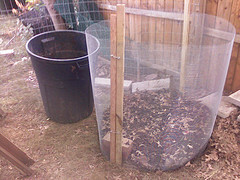 Lastly, and these are not necessary but can certainly help, are compost accelerators and compost starters. While it is true that fresh compost and dirt/soil will be okay to get your compost pile rolling, a compost starter or accelerator can also speed up the process, and leave you with a wonderful heap of compost in no time. So now you know the things you may need to get started – go forth and get to composting! 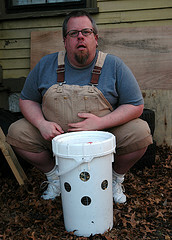 A Spinning Composter: Useful, or overkill? Spinning or tumbling composters can be quite popular – especially when it comes to the spring and summer months, or when it comes to keeping your compost in check. 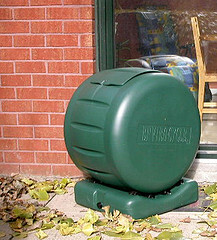 However, there seems to be an ongoing debate – are these composters useful, or is it just too much overkill? Well, while there may seem to be more advantages than disadvantages to owning a spinning or tumbling composter, we have decided to lay the pros and cons out for you so you can help decide for yourself.